The Collaborative Life Science Building & Skourtes Tower is a unique project opening in June 2014 to bring together Oregon Health & Science University, Oregon State University and Portland State University in one location to benefit all of Oregon. The entire 650,000-square-foot complex on Portland’s South Waterfront consists of two parts, including the 12-story Skourtes Tower on the North and a five-story South wing connected by an atrium, along with underground parking. 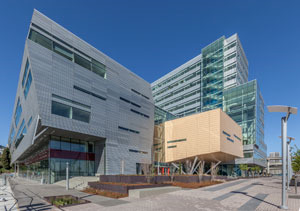 The building includes lecture halls, classroom labs, specialty research centers, a state-of-the-art facility for Oregon Health & Science University School of Dentistry, and offices for health professionals and educators from multiple institutions. $83 million in Oregon Health & Science University philanthropy, including a $40 million anonymous gift to OHSU and $10 million from Bonnie and Gene Skourtes, D.M.D. This project costs a total of $295 million and will leverage sources of multiple universities to offer the best life science education and research opportunities for students and Oregon researchers. This facility will also strengthen partnerships between the universities while expanding their teaching facilities, class sizes, and research activities. It provides an opportunity for Biotechnology researchers from different health care professions to share spaces, learn alongside each other, and work collaboratively through a variety of research programs. Every aspect of the design of the building is to encourage human interaction and collaboration to face collective challenges and opportunities in the rapidly changing bioscience field. The key to bioscience is research, and Oregon is blessed with a variety of public universities such as Oregon Health & Science University, University of Oregon, and Oregon State University, as well as other private research institutions. Biotechnology Calendar, Inc. is organizing three BioResearch Product Faire™ Events in Oregon to help laboratory supply companies network with Oregon researchers. If you are a laboratory supply company interested in increasing your sales numbers in Oregon, please read on for more details about these three BioResearch Product Faire™ Events at three different institutions. The University of Oregon, Eugene is one of only 60 public and private institutions, which have been selected to belong to the Association of American Universities. The university spends approximately $75 million in research annually. Please click the button below for more information about the 4th BioResearch Product Faire™ Event at the University of Oregon on September 9th 2014. The Environmental Health Sciences Center, which provides coordination and stimulation of vigorous interdisciplinary environmental health research and training as related to human health. The Marine/Freshwater Biomedical Science Center, which promotes research and training activities that utilize aquatic research models to investigate environmentally related human diseases. Please click the button below for more information about the 9th BioResearch Product Faire™ Event at Oregon State University, Corvallis on September 10th. Oregon Health & Science University is one of the premier biomedical research institutions in the nation. As the cornerstone of Oregon’s bioscience industry, the university is among the top 3 percent of about 2,000 institutions competing for research dollars. OHSU’ s researchers, educators, and clinicians attract nearly $115 million in grants each year. Please click the button below for more information about the 12th BioResearch Product Faire™ Event at Oregon Health & Science University on September 11th. 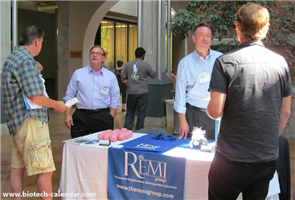 There are more BioResearch Product Faire™ Events available at different institutions across the nation. Please read the National Show Schedule for 2014.